This is the third and final post in a series of three about my travels with my dad over October break. You can read the introduction to the trip here, and my posts about Bangkok and Hanoi here and here, respectively. The last four days of our travels found us in beautiful Hoi An, which is located in central Vietnam. Hoi An is often under water at this time of year, a fact unknown to me until we arrived. Our travels there could have been really disappointing, but we were lucky enough not to see any rain over the course of the week. 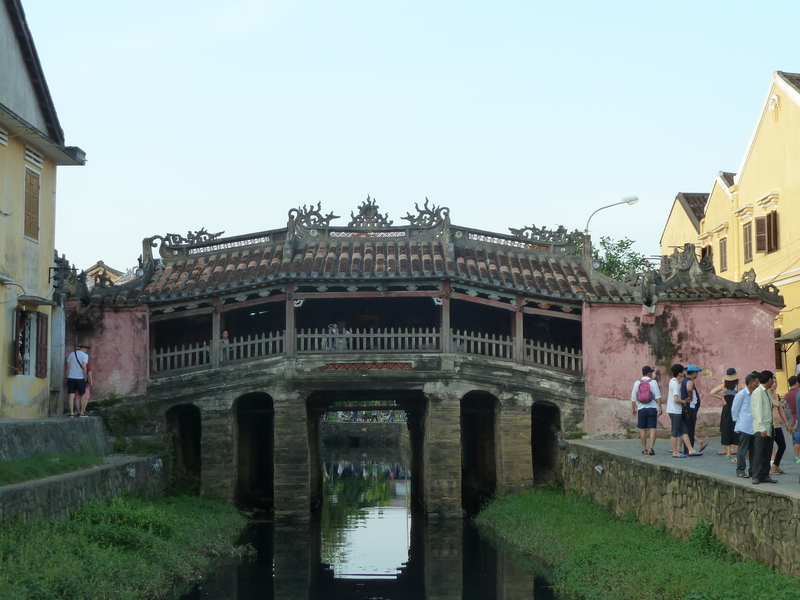 As a result of the threat of weather, however, Hoi An was largely empty of tourists. In addition to being a nice place by itself, Hoi An is also a wonderful base for half-day trips to historical and interesting sites nearby. 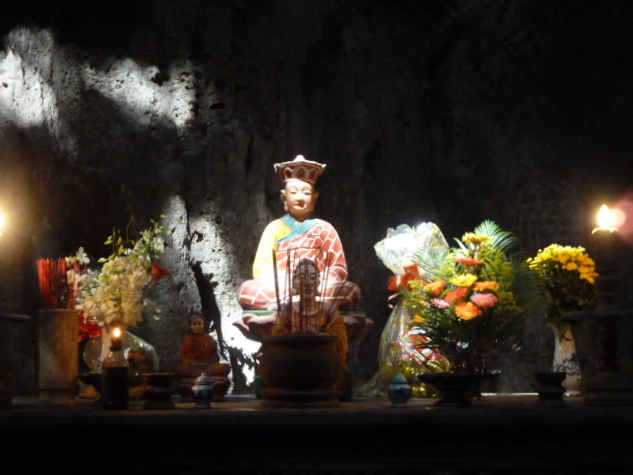 We took two separate trips out of Hoi An during our time there; the first was to My Son, an ancient Hindu temple site and burial ground for Cham kings dating to the fourth century. The complex must have been massive in its heyday, but much of it was destroyed by American bombs during the Vietnam War. There are very clearly marked walking paths because of unexploded ordnances all around the site, another wartime souvenir. Dad and I visited My Son as part of a tour with a very informative guide; he pointed out weathered motifs and symbols carved into the stone that we probably would have missed without him. Along with about half of our tour group, we chose to take a boat along the Thu Bon River to return to Hoi An. The boat afforded us wonderful views of the river and of rural life on its banks. 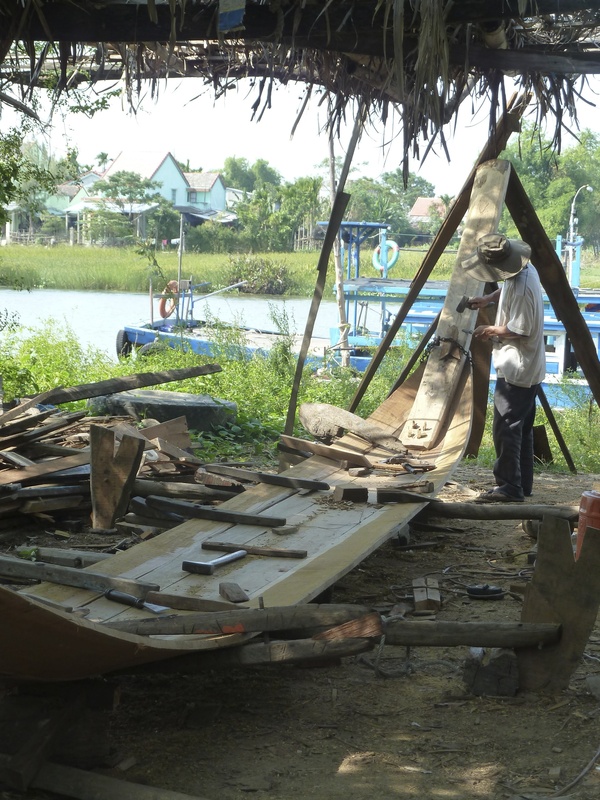 Along the way to Hoi An, we stopped on Cam Kim Island, a village known for its traditional crafts. Now that I’ve seen this, I wonder how non-traditional boats and ships are made? 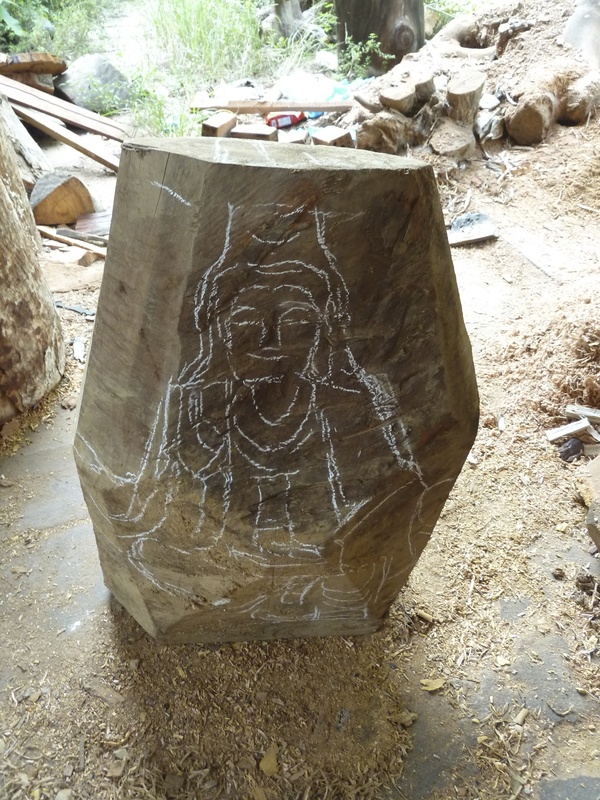 Somehow, it had never occurred to me that artists draw their patterns before starting to carve. Vietnam’s Marble Mountains, located in nearby Da Nang, was our destination the following morning. The Marble Mountains are exactly what they sound like – jutting hills of marble that are no longer quarried because they’d disappear. We took the elevator to Thuy Son, the highest peak, and then made our way down, exploring the Buddhist pagodas, Hindu temples, and various shrines and altars that dot the site. 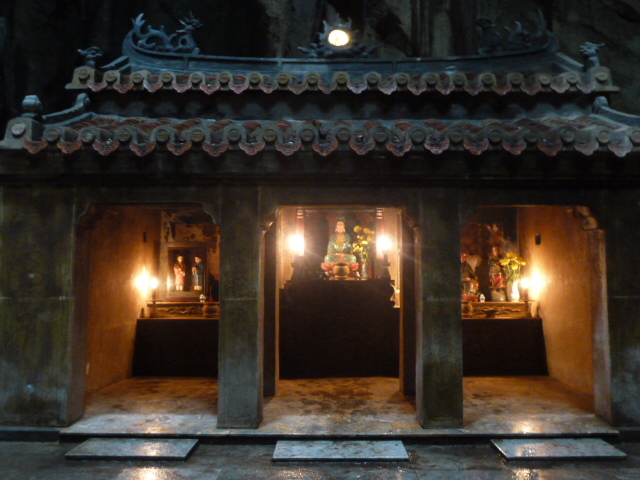 There are also caves on the mountains, including Tang Chan Cave, which contains a few altars and statues. What is truly spectacular about the cave, however, is the sunlight streaming through large holes in its top. When the light is just right, it casts a gorgeous, unearthly light on the altars. In the afternoon, we wandered around Hoi An’s Ancient Town to take advantage of the ticket scheme that allows access to five historical sites within the town. The ticket is required to visit the vast majority of assembly halls, historic homes, and even some museums, so we saved it for our last afternoon when we knew we’d have the longest amount of daylight in town. 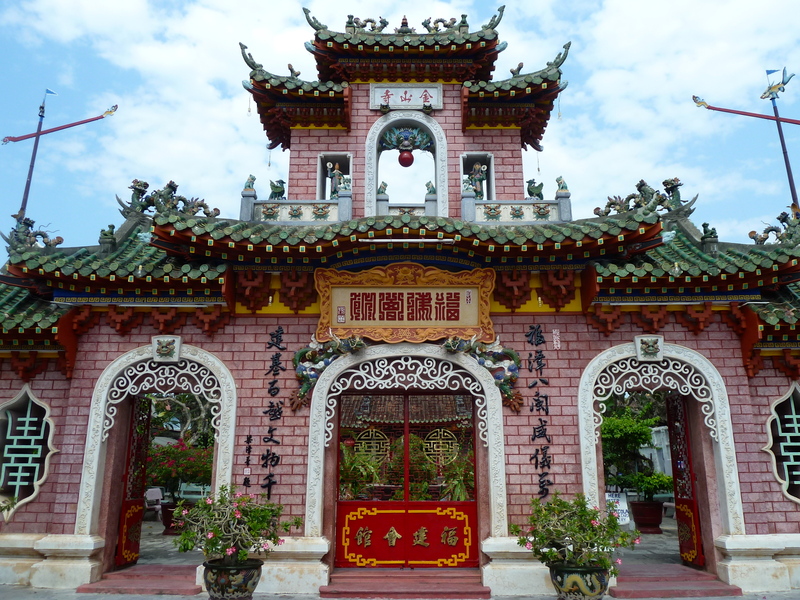 We visited the Phuoc Kien Assembly hall, which started as a pagoda and later became a temple for one of Hoi An’s Chinese groups. It is home to an altar to the Goddess of the Sea, which I thought was really interesting. There was also an altar shaped like a boat, which was beautiful. I love learning about groups of people, their livelihoods, and their values through religious art and artifacts. What a way to gain insight into the soul. Along with our ticket scheme wanderings was a very brief stop at the Museum of Folk Culture, which was interesting largely because the door of the museum was open, all the lights were off, and there was no one inside but us and another equally confused tourist. The Tan Ky House, on the other hand, was interesting in itself. 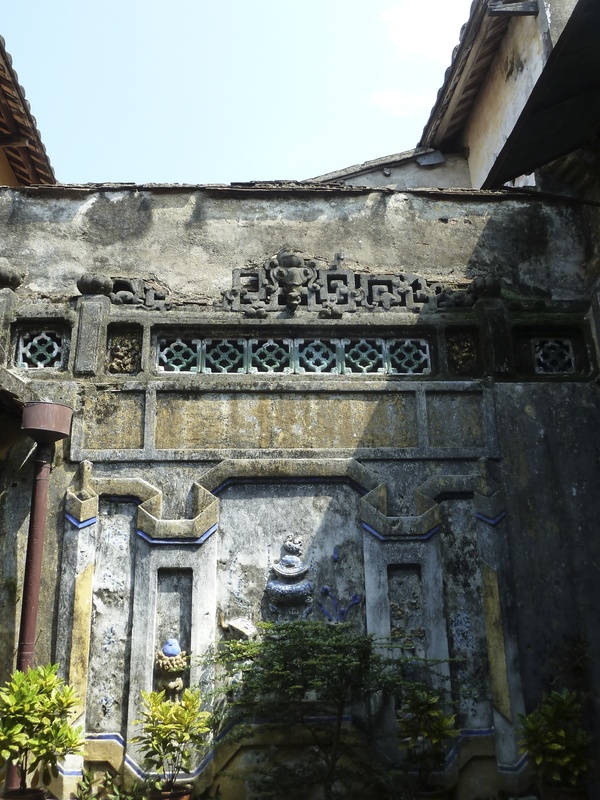 The Tan Ky House is a shop house dating from the late eighteenth century that incorporated Vietnamese, Chinese, and Japanese architectural styles. I admit, I didn’t know that so many ethnic groups and nationalities call Hoi An home, and have a place in the city’s history as a trading port. The most interesting stop on our somewhat guided wander was the Handicraft Workshop where we saw a performance of traditional music and dance. By far my favorite part was a musical piece that I can best describe as ancient jazz. A musician who would have been a saxophone player in a western jazz group played a sort of double-bow violin that didn’t seem to be made of anything but strings and a small wooden base. He had a solo in the middle of the piece that was creative, innovative, and playful; I couldn’t understand how such an unassuming instrument even made sounds, let alone such music! Neither of us were ready to leave Hoi An early Sunday morning. I, at least, have a mental list of things I want to do when I return, which I hopefully will. There is now a direct flight from Singapore to Hoi An, so it is certainly a possibility. Dad and I had an unbelievable time during our ten days of travel together. I am so glad to have shared such a wonderful experience with him. We both learned a lot over the course of our trip and I’m already looking forward to the next one! Previous PostTravel Guide: HanoiNext PostRecipe Box: Roasted Veggies, Halloumi Cheese, and Salmon – Oh my! Very enjoyable! You did a great job here. And the photos are wonderful.